This article is about the actor. For the professional wrestler, see Sonjay Dutt. Dutt was arrested under the Terrorist and Disruptive Activities (Prevention) Act in 1993. Charges of terrorism were dropped but he was convicted of illegal possession of weapons. After serving his sentence with good behaviour and conduct, he was released in 2016. Dutt's life receives considerable media coverage in India, and in 2018, Sanju, a biopic based on his life (which also saw a special appearance by him), was released to positive reviews and emerged as one of the highest-grossers of Indian cinema. Dutt was born to cinema actors Sunil Dutt and Nargis. He has two sisters, Priya Dutt and Namrata Dutt. His mother died in 1981, shortly before his debut film's premiere; her death is cited as the instigator of his drug abuse. As a child actor, Dutt appeared briefly as a qawali singer in the 1972 film Reshma Aur Shera, which starred his father. Dutt made his Bollywood movie debut with the box-office super hit Rocky in 1981. Dutt then went on to star in Vidhaata, the highest-grossing Hindi film of 1982, along with movies like Main Awara Hoon (1983). In 1985 he shot Jaan Ki Baazi, his first film in two years. The 1986 film Naam was a turning point in Dutt's career, it was a major commercial and critical success. Dutt appeared in successful films throughout the '80s such as Imaandaar, Inaam Dus Hazaar, Jeete Hain Shaan Se (1988), Mardon Wali Baat (1988), Ilaaka (1989), Hum Bhi Insaan Hain (1989), Kanoon Apna Apna (1989) and Taaqatwar. His performances in both Kabzaa (1988) and J. P. Dutta's 1989 Hathyar were both well received by critics although both films only managed average collections at the box office. In the late 1980s he was seen in a number of multi-starrers alongside actors like Govinda, Mithun, Dharmendra, Jackie Shroff and Sunny Deol. His successes continued in the 1990s, with films that include Tejaa, Khatarnaak, Zahreelay, Thanedaar, Khoon Ka Karz, Yalgaar, Gumrah, Sahibaan and Aatish: Feel the Fire. He went on to star in some of the most era-defining Indian films of the early 1990s such as Sadak, Saajan (for which he was nominated for the Filmfare Best Actor Award) and Khalnayak, for which he earned his second Filmfare Best Actor Award nomination. The Hindu wrote that "Sanjay's earlier films (like Naam and Sadak) got him a lot of favourable attention." and "Saajan established Sanjay Dutt as the conventional soft hero. "Saajan was the highest-grossing Bollywood film of 1991, and Sadak was the sixth highest grosser of 1991. Khalnayak was a box office success. The movie was the second-highest grosser of 1993. This was followed by another box office success Gumrah, this was Dutt's second consecutive hit of the year. Dutt's first film after his 1993 arrest was Daud (1997). It did not do well at the box office. He followed this with the 1998 Dushman which did well at the box office. 1999 was an excellent year for Dutt and one that is regarded as his comeback, with all of his five releases being amongst the highest-grossing films of that year. He began it by starring in the Mahesh Bhatt-directed hit Kartoos, followed by Khoobsurat, Haseena Maan Jaayegi, Daag: The Fire and Vaastav: The Reality, for which he won many awards, including his first Filmfare Best Actor Award. His role in 2000's Mission Kashmir won him critical acclaim and a number of awards and nominations. Dutt was also invited by the President of India to Rashtrapati Bhavan for his performance in the movie. As the decade went on, he continued to play lead roles in popular and critical successes such as Jodi No.1 (2001), Pitaah (2002), Kaante (2002) and the National Award-winning film Munna Bhai M.B.B.S. (2003), which garnered him several awards. At the box office Munna Bhai M.B.B.S. achieved a silver jubilee status (25-week run) being one of only eight films to have achieved this status since the year 2000. In its 26th week of release, the film could still be found playing on 257 screens throughout India. Later successes came with Musafir (2004), Plan (2004), Parineeta (2005) and Dus (2005). He won critical acclaim for his performances in Shabd (2005) and Zinda. The sequel of Munna Bhai M.B.B.S., Lage Raho Munna Bhai was released in late 2006. Dutt received a number of awards for his performance in the film, along with an award from the Prime Minister Manmohan Singh for his work in the Munna bhai series. NDTV India counted the character Munna Bhai as one of top 20 fictional characters in Bollywood. Later Dutt starred in movies like Dhamaal (2007), Shootout at Lokhandwala (2007), All the Best (2009), Double Dhamaal (2011), Son of Sardaar (2012) Agneepath (2012) and PK. In January 2008, the Indian film Institute Filmfare listed 12 films featuring Dutt in its list of top 100 highest-grossing movies of all time. In its May 2013 edition "100 years of Indian cinema" Filmfare listed three films featuring Dutt in its top 20 list of highest-grossing Hindi films of all time, adjusted for inflation these films were Lage Raho Munna Bhai, Khalnayak and Saajan. Vidhu Vinod Chopra on 29 September 2016 announced that the third part of Munna Bhai series, starring Dutt in the title role, would begin soon. In 2017, Dutt appeared as the lead in Bhoomi, directed by Omung Kumar. In 2018 he starred in Saheb, Biwi Aur Gangster 3. On June 29, 2018, his biopic Sanju released in which he made a special appearance. Dutt and Alia Bhatt will soon be shooting for Sadak 2. In 2019, he joined the cast of historical film Bhuj: The Pride of India, which will feature an ensemble cast consisting of Ajay Devgn, Sonakshi Sinha and Parineeti Chopra. Dutt co-hosted the fifth season of the Indian reality show Bigg Boss along with Salman Khan. The show aired on Colors television from 2 October 2011 to 7 January 2012. Dutt later said it was Khan who persuaded him to co-host the show. Dutt and entrepreneur Indian Premier League cricket team owner Raj Kundra together launched India's first professionally organised mixed martial arts league—the Super Fight League—on 16 January 2012. Dutt married actress Richa Sharma in 1987. She died of a brain tumour in 1996. The couple have a daughter, Trishala, born in 1988, who lives in the United States with her maternal grandparents. Dutt's second marriage was to air-hostess-turned-model Rhea Pillai in February 1998. The divorce finalised in 2008. Dutt married Manyata (born Dilnawaz Sheikh) first registered in Goa in 2008 and then, in a Hindu ceremony in Mumbai, after two years of dating. On 21 October 2010, he became a father to twins, a boy and a girl. He is a devout Shaiva Hindu who has read holy scriptures and theological works. Bombay (now Mumbai) suffered a series of serial bombings in 1993. Dutt was among several people associated with Bollywood who were accused of involvement. It was alleged that Dutt accepted a delivery of weapons at his house from Abu Salem and co-accused Riyaz Siddiqui, who had also been implicated in relation to the Mumbai blasts. It was claimed that the weapons formed a part of a large consignment of arms connected to the terrorists. Dutt, however, in his confession stated that he took only one Type-56 from the producers of his movie Sanam, for his own family protection. It has also been reported that Sanjay Dutt's father Sunil Dutt's political rivalry caused Sanjay Dutt's conviction. In April 1993, he was arrested under the provisions of the Terrorist and Disruptive Activities (Prevention) Act (TADA). Dutt was granted bail by the Supreme Court of India on 5 May 1993; however, on July 4, 1994 his bail was cancelled and he was re-arrested. On October 16, 1995 he was granted bail. Abdul Qayyum Abdul Karim Shaikh, who was thought to be a close aide of the terrorists' ringleader, Dawood Ibrahim, was arrested. Dutt had given Qayuum's name to the police when confessing to arms possession, saying that in September 1992 he had bought a pistol from Qayuum in Dubai. On 31 July 2007, Dutt was cleared of the charges relating to the Mumbai blast; however, the TADA court sentenced Dutt to six years' rigorous imprisonment under Arms act for illegal possession of weapons. According to The Guardian, "The actor claimed he feared for his life after the notorious 'Black Friday' bombings, which were allegedly staged by Mumbai's Muslim-dominated mafia in retaliation for deadly Hindu-Muslim clashes a few months earlier. But the judge rejected this defence and also refused bail." Dutt was returned to jail at Arthur Road and soon after moved to the Yerawada Central Jail in Pune. Dutt appealed against the sentence and was granted interim bail on 20 August 2007 until such time as the TADA court provided him with a copy of its judgement. On 22 October 2007 Dutt was back in jail but again applied for bail. On 27 November 2007, Dutt was granted bail by the Supreme Court. On 21 March 2013 the Supreme Court upheld the verdict but shortened the sentence to five years' imprisonment. Dutt was given a month to surrender before the authorities. Dutt has said that "I am not a politician but I belong to a political family." He was persuaded by a close friend to contest the 2009 Lok Sabha elections as a candidate for the Samajwadi Party, but withdrew when the court refused to suspend his conviction. He was then appointed General Secretary of the Samajwadi Party, leaving that post in December 2010. In March 2013 the Supreme Court upheld Dutt's five-year sentence, 18 months of which he already spent in jail during the trial. He was given four weeks to surrender to the authorities, the court having refused to release him on probation due to the severity of the offence. On 10 May, the Supreme Court rejected Dutt's review petition for the reconsideration of his conviction and asked him to surrender on the stipulated date. on 14 May, Dutt withdrew the mercy plea and surrendered to the Mumbai Police on 16 May 2013. Just before the surrender, the Mumbai jail authority got an anonymous letter threatening Dutt's life. Dutt filed an appeal to allow him to surrender before entering Yerwada Central Jail. Later, Dutt withdrew this request too. He was paroled from 21 December 2013. The parole was extended three times until March 2014, raising concern in Bombay High Court and a proposal from the Government of Maharashtra to amend the law of parole. He returned to Yerwada Central Jail after his parole ended. Dutt was out on a two weeks' furlough granted by the Yerwada Central Jail authorities on 24 December. He was subsequently incarcerated in Yerwada Central Jail, to complete his jail term. He was released from there on 25 February 2016 after serving his sentence. A biopic film based on the life of Dutt, titled Sanju, in which Ranbir Kapoor portrays the title character, was released worldwide on 29 June 2018. ^ "I would love to write my biography: Sanjay Dutt". The Times of India. 13 February 2012. Archived from the original on 15 December 2015. Retrieved 3 October 2014. ^ "No sister gets along with her brother's wife: Dutt". Archived from the original on 24 September 2018. Retrieved 30 June 2018. ^ "Namrata Dutt reacts after watching Sanju: I didn't connect with Paresh Rawal and Manisha Koirala". Archived from the original on 12 July 2018. Retrieved 12 July 2018. ^ "Sanjay Dutt used to Drugs". bollywoodmantra.com. Archived from the original on 27 September 2013. Retrieved 22 August 2013. ^ PTI (2 September 2013). "Sanjay Dutt to do a qawwali after 41 years in Zanjeer". The Indian Express. Archived from the original on 7 August 2016. Retrieved 17 May 2016. ^ a b c d e f g h "Sanjay Dutt – On the wrong side of the law". 16 May 2013. Archived from the original on 9 July 2018. Retrieved 9 July 2018. ^ "Naam: The film Kumar Gaurav made for buddy Sanjay Dutt - Times of India". Archived from the original on 30 November 2018. Retrieved 9 July 2018. ^ a b "The Hindu : Like a phoenix he rises again". www.thehindu.com. ^ a b "Sanjay received critical acclaim for Kabzaa". stargold.in. Retrieved 2013-08-22. ^ "Sanjay received critical acclaim for Kabzaa And Hathyar". movies.addatoday.com. Archived from the original on 13 November 2013. Retrieved 22 August 2013. ^ "Sanjay rece". movies.addatoday.com. Archived from the original on 13 November 2013. Retrieved 22 August 2013. ^ "Boxofficeindia.com". 15 January 2013. Archived from the original on 15 January 2013. ^ "Boxofficeindia.com". 17 October 2013. Archived from the original on 17 October 2013. ^ "10 movies we couldn't imagine without Sanju Baba - The Express Tribune". 21 March 2016. Archived from the original on 9 August 2018. Retrieved 9 August 2018. ^ "Top India Total Nett Gross 1997 - - Box Office India". www.boxofficeindia.com. Archived from the original on 9 July 2018. Retrieved 9 July 2018. ^ "Top India Total Nett Gross 1998 - - Box Office India". www.boxofficeindia.com. Archived from the original on 9 July 2018. Retrieved 9 July 2018. ^ "Sanjay Dutt turns 57". www.msn.com. Archived from the original on 9 July 2018. Retrieved 9 July 2018. ^ "Sanjay Dutt feels his cult film Vaastav wasn't good - did you notice this fact in Sanju?". Archived from the original on 9 July 2018. Retrieved 9 July 2018. ^ Mehta, Suketu (2006). Maximum city: Bombay lost and found. ISBN 9780144001590. ^ "Top Earners 2003". boxofficeindia.com. Archived from the original on 25 May 2012. Retrieved 10 July 2008. ^ "Sanjay Received award by PM". www.in.com. Archived from the original on 13 November 2013. Retrieved 22 August 2013. ^ Singh, Nidhi (7 September 2017). "#4 Key Turning Points in the Career of Bollywood's favourite Baba". Archived from the original on 9 July 2018. Retrieved 9 July 2018. ^ "Work on Munnabhai 3 to begin next year: Vidhu Vinod Chopra". India Today. Archived from the original on 9 October 2016. Retrieved 9 October 2016. ^ "Omung Kumar's 'Bhoomi' to be Sanjay Dutt's comeback film". 20 November 2016. Archived from the original on 14 December 2016. Retrieved 10 July 2018 – via www.thehindu.com. ^ "Pic: Sanjay Dutt's new look for 'Saheb Biwi Aur Gangster 3' is menacing - Movies to look forward to | The Times of India". The Times of India. Archived from the original on 9 September 2017. Retrieved 28 September 2017. ^ "Saheb Biwi Aur Gangster 3: Sanjay Dutt, Chitrangada Singh begin shooting in Rajasthan". hindustantimes.com. 28 September 2017. Archived from the original on 28 September 2017. Retrieved 28 September 2017. ^ "Confirmed! Sanjay Dutt Makes an Appearance in 'Sanju'". ^ "CONFIRMED! Alia Bhatt – Sanjay Dutt to star in Mahesh Bhatt's Sadak 2 (EXCLUSIVE details on full star cast)". Bollywood Hungama. 1 September 2018. Archived from the original on 4 September 2018. Retrieved 6 September 2018. ^ "'Bhuj: The Pride of India': Sanjay Dutt, Sonakshi Sinha, Rana Daggubati, Parineeti Chopra and Ammy Virk join the Ajay Devgn starrer - Times of India". The Times of India. Retrieved 2019-03-22. ^ "Sanjay Dutt, Salman to host Bigg Boss 5 together". Mi Day. Archived from the original on 23 January 2013. Retrieved 16 May 2013. ^ "Salman convinced me for Bigg Boss: Sanjay Dutt". Hindustan Times. Archived from the original on 6 January 2012. Retrieved 16 May 2013. ^ Olivera, Roshni. "Ready for the Super Fight League?". The Times Of India. Mumbai. Archived from the original on 12 December 2013. Retrieved 19 January 2012. ^ "I have become a family man: Sanjay Dutt". The Express Tribune. Archived from the original on 11 January 2014. Retrieved 21 October 2010. ^ "Sanjay Dutt's tearful reunion with daughter". Archived from the original on 10 July 2018. Retrieved 10 July 2018. ^ "Sanjay Weds". Screen. Archived from the original on 25 August 2001. Retrieved 14 November 2018. ^ "Unknown starlet Dilnawaz's journey to Mrs Manyata Dutt". Ibnlive.in. Archived from the original on 8 August 2011. Retrieved 21 October 2010. 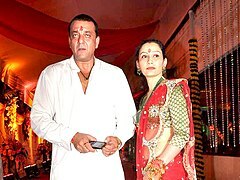 ^ "Sanjay Dutt marries Manyata". Reuters. 11 February 2008. Archived from the original on 18 April 2009. Retrieved 21 October 2010. ^ "Manyata Dutt delivers twins". Times of India. 21 October 2010. Retrieved 2010-10-21. ^ "Charges framed against Salem". Indian Express. 18 March 2006. Archived from the original on 29 August 2009. Retrieved 2009-04-19. ^ a b c d "Sanjay Dutt gets 6 yrs jail, taken into custody". IBN. 31 July 2007. Archived from the original on 19 December 2009. Retrieved 2009-04-19. ^ "1993 Mumbai blasts: Sanjay Dutt's confessional statement". Archived from the original on 9 July 2018. Retrieved 9 July 2018. ^ Kidwai, Rasheed (9 July 2018). "Reel vs real: The politics behind the life and crimes of Sanjay Dutt". Archived from the original on 24 July 2018. Retrieved 24 July 2018 – via Business Standard. ^ Ryan Clarke (12 April 2011). Crime-Terror Nexus in South Asia: States, Security and Non-State Actors. Taylor & Francis. pp. 58–. ISBN 978-1-136-73970-5. Retrieved 2013-05-16. ^ "Sanjay Dutt sentenced to 5 years in jail, gets 4 weeks to surrender". Indian Express. 22 March 2013. Archived from the original on 23 March 2013. Retrieved 1 April 2013. ^ "From arrest to release: A complete, 23-year-long Sanjay Dutt timeline". 25 February 2016. Archived from the original on 9 July 2018. Retrieved 9 July 2018. ^ "Man who supplied pistol to Sanjay Dutt arrested". Indian Express. 14 February 2007. Archived from the original on 29 August 2009. Retrieved 19 April 2009. ^ "93 blast accused Abdul Qayyum Shaikh arrested". rediff.com. 13 February 2007. Archived from the original on 30 August 2009. Retrieved 19 April 2009. ^ a b Randeep Ramesh. "Bollywood star gets six years as lengthy Mumbai bombing trial ends". the Guardian. Archived from the original on 31 December 2016. Retrieved 21 August 2015. ^ Imtiaz Jaleel (2 August 2007). "Priya to approach SC for Sanju's bail". NDTV. Archived from the original on 26 September 2007. Retrieved 31 July 2007. ^ "BBC NEWS - South Asia - Bollywood's Dutt appeals sentence". bbc.co.uk. Archived from the original on 21 January 2009. Retrieved 21 August 2015. ^ "Sanjay Dutt released from Pune jail". The Times of India. Archived from the original on 29 August 2009. Retrieved 21 August 2015. ^ "As it happened: I've been a good human, says Sanjay Dutt". First Post. 21 March 2013. Archived from the original on 26 May 2013. Retrieved 17 May 2013. ^ "Sanjay Dutt to contest elections on Samajwadi Party ticket". Reuters. 16 January 2009. Archived from the original on 4 September 2009. Retrieved 16 January 2009. ^ "Sanjay Dutt can't contest polls: Supreme Court". IBN. 31 March 2009. Archived from the original on 16 October 2012. ^ "Sanjay Dutt leaves the post of Samajwadi Party". yahoo. Archived from the original on 5 October 2013. Retrieved 22 August 2013. ^ "Sanjay Dutt convicted in 1993 Bombay blasts case, gets 5 years in jail". NDTV.com. 21 March 2013. Archived from the original on 23 March 2013. Retrieved 1 April 2013. ^ "Sanjay Dutt given 4 Weeks to surrender". hindubusinessline.com. Archived from the original on 30 December 2013. Retrieved 22 August 2013. ^ "1993 Mumbai blasts case: 1993 Bombay blast case: Supreme Court dismisses Sanjay Dutt's review petition". Economic Times. Mumbai. Archived from the original on 21 September 2017. Retrieved 10 May 2013. ^ "Review plea rejected: Sanjay Dutt will have to go to Jail". Southmonitor.com. Archived from the original on 2015-09-09. ^ "Sanjay Dutt withdraws plea, set to surrender before TADA court tomorrow/1116049/?rheditorpick#sthash.mToe0p5t.dpuf". Indian Express. 16 May 2013. Retrieved 2013-05-16. ^ "Sanjay Dutt reaches Tada court, will surrender shortly". The Times of India. 16 May 2013. Retrieved 2013-05-16. ^ "Sanjay Dutt to surrender today, jail gets threat letter". The Times of India. Retrieved 2013-05-16. ^ "Sanjay Dutt's parole over, leaves for Yerwada. In December 2014, he was out on Furlough for 14 days again". India Today. 22 March 2014. Archived from the original on 27 May 2014. Retrieved 28 May 2014. ^ "Out on Parole, Sanjay Dutt Watches PK With Family". NDTVMovies.com. Archived from the original on 26 December 2014. Retrieved 21 August 2015. ^ Rashmi Rajput (22 May 2013). "Sanjay Dutt shifted to Pune's Yerawada Jail". NDTV.com. Archived from the original on 18 May 2015. Retrieved 21 August 2015. ^ "How Bollywood star Sanjay Dutt spent his time in jail". BBC News. Archived from the original on 20 July 2018. Retrieved 22 June 2018. ^ "Shooting for Sanjay Dutt biopic featuring Ranbir Kapoor begins, tweets Rajkummar Hirani". Indian Express. 14 January 2017. Archived from the original on 15 January 2017. Retrieved 20 September 2017. ^ Desk, The Hindu Net (2018-05-30). "'Sanju' trailer watch: drama, drugs and Ranbir Kapoor". The Hindu. ISSN 0971-751X. Retrieved 2018-05-30. ^ "Sanju Trailer: Here's how Bollywood is applauding Ranbir Kapoor for his performance - Times of India ►". The Times of India. Archived from the original on 30 May 2018. Retrieved 30 May 2018. Wikimedia Commons has media related to Sanjay Dutt.